Have fun reviewing your ABC's by connecting the dots from A to Z, then help spiff up Mr. Cat by adding a bit of color! 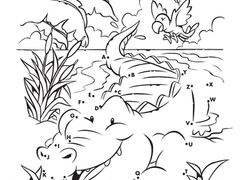 On this kindergarten reading and coloring worksheet, kids consider the clues and follow the letter O in a dot to dot to see the mystery O picture: an octopus! What sport is this adorable frog playing? Connect the letters from A to I to find out! Draw block letter E's by connecting the dots on this fun alphabet worksheet. Connect this ABC dot-to-dot by following the alphabet from A to Z, and get a surprise visit from a toothy friend! Just when you thought your child has learned ABC's in every way possible, there's a block letter dot-to-dot worksheet like this one. Connect the dots while drawing an uppercase and lowercase letter G.
Teach the letter C with this fun dot-to-dot page, and color it in when you're done! Connect the dots on the page to connect the dots in your child's memory for the alphabet. 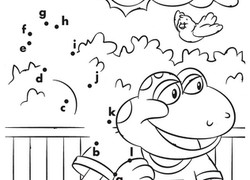 On this kindergarten reading and coloring worksheet, kids consider the clues and follow the letter B in a dot to dot to reveal the mystery B picture: a barn! Want a new way to learn the alphabet? Just connect the dots to create block letter R's.